Detail of Xmas tree. In Ruhleben Camp, Xmas 1915. Masterman Coll., Box 2 Seq. 596. In December of 1915, Ruhleben held its own Christmas truce. 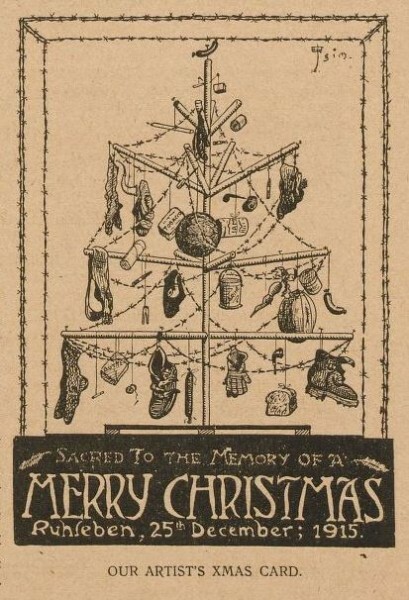 As we saw in the previous post, the German authorities gave internees special permission to send copies of In Ruhleben Camp’s “Xmas Number” back Home, where family and friends would find a full-page note of thanks and holiday greetings. Stobsiade plays on the title of an 18th century mock epic poem The Jobsiade by German physician Carl Arnold Kortum. This satirical poem relates the antics of Hieronymus Jobs, a “Bummelstudent” (“strolling-student”) who remains at university as long as possible not because he takes his studies seriously but because he takes his leisure seriously. If the editors of IRC caught the joke, they would have enjoyed it. Ruhlebenites often complained of being treated like schoolboys with curfew, roll call, and rules abounding, and no doubt the internees at Stobs resented similar encroachments on their adult autonomy. Moreover, while non-commissioned military POWs could be forced to do labor under the 1907 Geneva Convention, civilians were generally exempt. And if Stobs was anything like Ruhleben, then internees on both sides used this “enforced leisure” (as the British Camps Library committee called it (qtd. in King, p. 256)) to become students once again, attend public lectures or take classes in the camp, and “swot”* languages.” In many cases, they did so not because they took their studies seriously, but because they took their distractions seriously. This was probably true, but it flatly contradicted the jingoistic British press, and it is curious to speculate how readers back Home responded. The popular press on both sides exaggerated the miseries of its own imprisoned civilians, while rebuking the home government for (fictional) indulgences lavished on interned enemies (e.g. Stibbe, pp. 83-84). Paul Cohen-Portheim, a German civilian interned in the “gentleman’s camp” at Wakefield, near Leeds, blamed the media titan Lord Northcliffe for propagating absurd reports that the “pampered Huns” at Wakefield supped at fabulous feasts, played on “golf courses that never existed,” and enjoyed “liaisons with women that would have been impossible” (Cohen-Portheim, p. 74). As Cohen-Portheim mused bitterly, “the real truth” was that “what happened to the prisoners on one side happened to those on the other,” based on “a system of mutual reprisals from which the authorities dreamt as little of abstaining as…the flying forces refrained from ‘punitive expeditions’” (Cohen-Portheim, p. 75). Even if IRC did not intend to discredit propaganda, it could nonetheless do some good for German internees. The historian Matthew Stibbe confirms Cohen-Portheim’s description of “reprisals,” but also observes the potential for “reprisals of good” advocated by the Bishop of Winchester in 1916. For example, when the Swiss Quaker and peace activist Elisabeth Rotten solicited scientific instruments from German firms and individuals (including her friend Albert Einstein) for Ruhlebenites, the Friends Emergency Committee in Britain responded with similar donations for interned Germans (Stibbe, p. 145). Such exchanges were more frequent later in the war, especially as Germany began to see defeat engraved in the trenches across France, but the editors of IRC may have picked up the principle early. Detail. In Ruhleben Camp, Xmas 1915. Masterman Coll., Box 2 Seq. 560. As yet another generous gesture, the Xmas Number announced that donations collected to endow a “Ruhleben Bed” at a Red Cross Hospital would be sent Home around Christmastime. This spirit of charity and goodwill turned out to be the high note on which In Ruhleben Camp folded its pages and bid goodbye. Its rambunctious items give no hint that this issue would be the last, nor is it clear why the offices at Fleet Street closed their doors for three months. But so it was. Apart from a literary journal called Prisoners’ Pie that rang in the New Year, there was no substantial Ruhleben publication until March 1916, when the “Camp Rag” returned with the slightly less catchy title of The Ruhleben Camp Magazine, under new editorial direction but up to the same old tricks. Cohen-Portheim, Paul. Time Stood Still: My Internment in England 1914-1918. London: Duckworth, 1931. King, Edmund (2013). ““Books are more to me than food”: British prisoners of war as readers, 1914-1918.” Book History 16. pp. 246-271.